Simon & Schuster, 9781476704586, 480pp. In this mesmerizing debut, a young American discovers he may be heir to the unclaimed estate of an English World War I officer, which launches him on a quest across Europe to uncover the elusive truth. 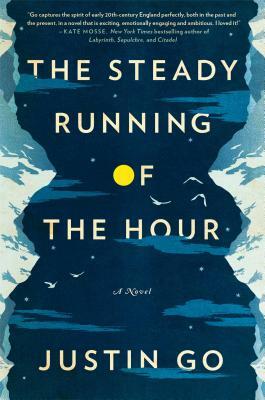 A QUEST NOVEL and a historical tour de force, The Steady Running of the Hour unravels a tale of passion, legacy, and courage reaching across the twentieth century. In 1924, the English mountaineer Ashley Walsingham dies attempting to summit Mount Everest, leaving his fortune to his former lover, Imogen Soames-Andersson—whom he has not seen in seven years. Ashley’s solicitors search in vain for Imogen, but the estate remains unclaimed. Nearly eighty years later, new information leads the same law firm to Tristan Campbell, a young American who could be the estate’s rightful heir. If Tristan can prove he is Imogen’s descendant, the inheritance will be his. But with only weeks before Ashley’s trust expires, Tristan must hurry to find the evidence he needs. From London archives to Somme battlefields to the Eastfjords of Iceland, Tristan races to piece together the story behind the unclaimed riches: a reckless love affair pursued only days before Ashley’s deployment to the Western Front; a desperate trench battle fought by soldiers whose hope is survival rather than victory; an expedition to the uncharted heights of the world’s tallest mountain. Following a trail of evidence that stretches to the far edge of Europe, Tristan becomes consumed by Ashley and Imogen’s story. But as he draws close to the truth, Tristan realizes he may be seeking something more than an unclaimed fortune. The Steady Running of the Hour announces the arrival of a stunningly talented author. Justin Go’s novel is heartrending, transporting, and utterly compelling. Justin Go attended the University of California at Berkeley, where he graduated with a BA in history and art history. He also holds an MA in English from University College London. He has lived in Tokyo, Paris, London, New York City, and Berlin. He is currently at work on his second novel. "Go’s debut is ambitious in many ways...it depicts a love that transcends time and disdains convention; and it fluidly moves between past and present."